Tattoo Artist The Right Way!" "This is one of those guides full of specific information on tattooing you will not find ANYWHERE!" Subject: Finally, INSIDER Tattoo Information from REAL Tattoo Artists! What I'm about to share with you is something that is almost completely unheard of. In early 2008 I embarked on a tattoo project unlike any other. Many people, like yourself, have probably found that learning how to tattoo or simply learning from great tattoo artists is like pulling teeth...TATTOO ARTISTS SIMPLY DO NOT WANT TO REVEAL THEIR TRADE SECRETS. Period. "Well, that is about to change..."
"Imagine if you had the opportunity to sit down with 21 TOP-NOTCH professional tattoo artists and ask them these 9 VITAL questions regarding tattooing..."
"Who or what is your biggest influence in your tattoo work and why?" 2. "What was the most difficult thing to learn in tattooing for you and why?" 3. "How do you usually advertise or market yourself?" 4. "What brand of inks do you recommend or use and why?" 5. "What is the best brand of tattoo machines that you recommend and why?" 6. "What do you believe is the most important tattooing skill one should learn how to master and why?" 7. "What is your best advice or tips to someone new to the art of tattooing?" 8. "What is the best way to practice for those just starting out?" 9. "What is the best way for one to land an apprenticeship?" These are the questions that anyone who has ever been seriously interested in learning how to tattoo or to become a tattoo artist have YEARNED to know! What I have done is compiled a comprehesive guide that contains ALL 21 professional tattoo artists and their detailed answers to the above information. They were very open and giving with their time and information, which is a VERY RARE thing for great tattoo artists to do. It takes them YEARS to get to the level that they are at and to learn what they have learned...but now you can literally LEARN FROM THE BEST! I'm not talking about new tattoo artists that have been at the artform for something like a year. been tattooing for nearly 20 years!" In this comprehensive guide you will learn a TON of great information that any up and coming tattoo artist would nearly die to get their hands on! Discover what influences and artists have influenced these artists, the best kinds of inks, the best tattoo machines, the best ways to get started tattooing, the best ways to practice, learn what to do and what not to do, tips and advice on landing an apprenticeship, and more great info! Not only will you get their full answers to all the questions from EACH artists...you will also be able to see their own websites, FULL COLOR pictures of their work, and learn about what they specialize in! The Ultimate Tattoo BlackBook is in stunning rich color. Not only will you get advice and valuable tips from these vetern tattoo artists, you will get to see the PROOF that they are indeed top notch artists! Included with each tattoo artists information, tips and advice, you will get to see some of their finest work in full color! Finally....all the real information you need to know from the absolutely right people, the true artists themselves! There has NEVER been an informational guide put together like this. This is the top information tattoo enthusiasts DREAM about! Over 120+ full pages of pure tattoo insider information! Full color artwork also included! Get INSTANT access to this downloadable ebook! I've read enough, I want to order my copy! If you walked into tattoo shop after tattoo shop and asked tattoo artists these 9 vital questions regarding tattooing that are answered in The Ultimate Tattoo BlackBook...in many cases, you would probably get thrown out of the shop or cussed out. Getting tattoo artists to take time to discuss all the details is a really, really rare thing. I KNOW how important and highly valuable this information is. 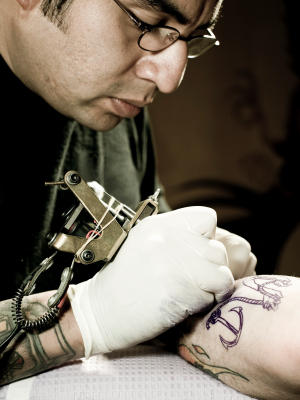 It is probably THE most valuable information on tattooing anywhere if you think about it. Since it is SO valuable and SO rare, I could easily ask a very premium charge for it. For all the years and years of tattoo "wisdom" that is in these pages, it is well worth hundreds of dollars. Think about all the time and effort these artists have put in to their artform. Think about all the trial and errors, the tough times they had to face, the lessons they had to learn. Now is YOUR chance to learn all this PRICELESS information without having to struggle for years, learning and failing, searching for the right answers, etc. I've put all this great information in ONE place for you...The Ultimate Tattoo BlackBook. 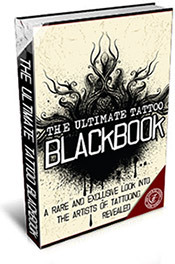 "The Ultimate Tattoo BlackBook is a fantastic idea that should be kept going to help artists new and old. One day I do hope to appear in a book such as this one." "Well after reading the ebook, I have a few things to say. Firstly, WOW, its fantastic to read some testimonies from artists around the country who have either been in the business for years or just really got in the game. The influences that started them out to the machines and inks they use today is wonderful! I agree, that each artist has in there own right , the idea of the right way and wrong way to ink. Art is a form that will be around much longer than we will, and the art of tattooing will just grow stronger with each passing year as new and exciting techniques come and go. The Ultimate Tattoo BlackBook is a fantastic idea that should be kept going to help artists new and old. One day I do hope to appear in a book such as this one. learning new techniques and different things everyday. Coming to the USA has taught me so many different things, and seeing the way that america has different ideas and colors available, machines and the such, this ebook really helps to make a difference. has achieved with the techiques they have learned. If someone out there says that they are at the top of the game, then they really do not know the whole industry. Each day is a learning curve, and I must say even the best of the best have bad days. I personally am a detailist, and find that every day there are new and wonderful things to learn, from designs to colors to personalizing a design that walks in the door. out what I like. This is an awesome informational ebook..."
"The Ultimate Tattoo BlackBook does not only offer great insight to some of the best artists, it also offers great ways to network with the people who already know what works. I feel I have the knowledge now to research inks, guns and artists to figure out what I like. This is an awesome informational ebook, I look forward to reading updated versions in the future...thanks!" "I found your ebook very informative. Knowing what the professionals use and think about their equipment and styles tells me a lot!" start a career as a tattoo artist..."
" First, I would like to say that this is truly an eye opener for anyone wanting to start a career as a tattoo artist. I have now realized that it is a very long road to travel. Your book is something that all people should definitely read before they decide they want to do this for a living. A lot of good information for all, especially important information concerning cross contamination, sterilization and other classes involved in the beginning process. Thank you again for giving me the opportunity to read and comment on your book." "The ebook was real good! As a beginner it's totally changed my direction in the industry and has made my future steps a whole lot clearer, for the better. I don't know where you keep coming up with these helpful stepping stones." pleased to say it was awesome reading..."
" I have just finished reading The Ultimate Tattoo Blackbook and I am pleased to say it was awesome reading on personal stories and ideas of artists out there who like me and many others have had to start at the bottom and work their way to the top. I was also happy to read some of their ideas and personal preferences that match my own in a lot of areas which gave me more confidence and understanding of this dynamic industry. So thank you very much again for bringing this to me. I will be compiling a list of artists who have influenced me for reference in the future thank you once again." of dollars for this nearly ESSENTIAL and VERY RARE information?" Right now, you are one step away from a pure GOLDMINE of valuable, tattoo artist information directly FROM THEM. This is the real deal...no fluff, no filler information, only the good stuff straight from the artists. Remember, this is an ebook only...which means that once you make YOUR purchase below, you will be directed to a download page where you can download the guide to your computer INSTANTLY! No need to wait! "Oh yeah...I need to tell you about the "Full Satisfaction " guarantee!" Lastly, I want to offer you a 100% "Full Satisfaction" 30 Day Guarantee! "That is how confident I am about this guide!" After you place your order below, you will be directed to a download page where you can have access to download the entire guide to your computer! You get it instantly without any waiting! The whole process takes less than 2 minutes and you will be reading this great guide! Simple and to the point...just the way you like it! Remember, this is information that is EXTREMELY RARE. Tattoo artists, as you may know, do not like to reveal this type of information simply because it can takes YEARS of experience and trials and errors to learn. fail for years and years! for a heck of a steal!" Instant Download Right After Purchase! Good luck and I really hope you enjoy, The Ultimate Tattoo BlackBook! It is full of not only some great tattoo information that many want to know, but also some stunning and beautiful tattoo artwork done by the pros! P.S. Don't forget, I offer a 100% "Full Satisfaction" 30 Day Guarantee on this fantastic guide! Be sure to get your copy for the limited time price!